Earlier tonight (Sat. 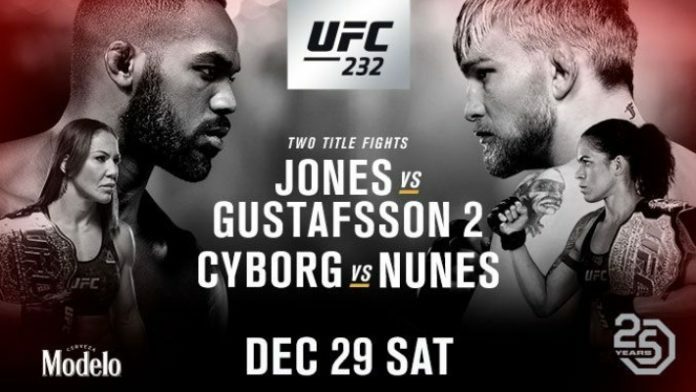 December 29, 2018) UFC 232 went down on pay-per-view (PPV) from The Forum in Inglewood, California. The event was the final UFC event of 2018 and featured some amazing fights. The Inglewood crowd turned out for the event with a total attendance number of 15,862 – a sell-out. The gate was $2,066,604. There were also some well-deserved bonuses tonight. In the opening fight of the FS1 prelims, UFC Hall Of Famer BJ Penn made his return. He went face-to-face with submission specialist Ryan Hall. Hall pulled off a spectacular first-round submission on Penn via heel hook. With the win, Hall took home a Performance Of The Night bonus worth $50,000. Kicking off the main card on PPV was the return of former 145-pound title challenger Chad Mendes. He faced rising featherweight star Alexander Volkanovski. Both men had tremendous moments during the bout, but Volkanovski picked up the huge TKO win late in the second. The bout was good enough to earn Fight Of The Night at UFC 232. Both Mendes and Volkanovski will take home an extra $50,000. And of course, the co-main event of the evening featured history being made. UFC women’s bantamweight champion Amanda Nunes defeated Cris Cyborg to win the women’s 145-pound title. Nunes finished Cyborg in under a minute via knockout. With the win, she’s the first-ever female dual-weight champion in UFC history. Her historic performance was enough for a $50,000 Performance Of The Night bonus.